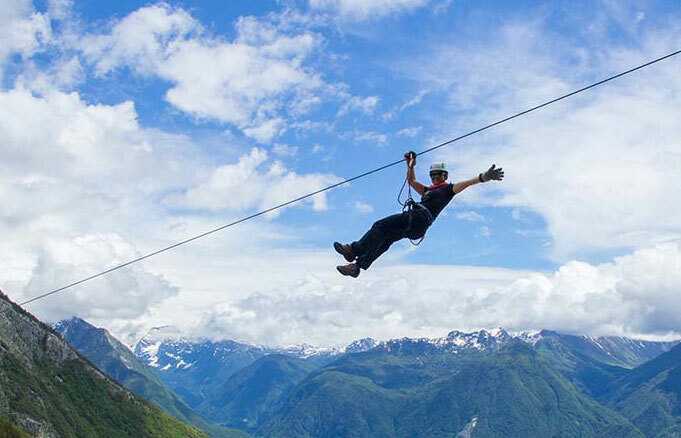 One of the largest zipline parks in Central Europe and the largest in Slovenia. One of the largest zipline parks in Central Europe and the largest in Slovenia is located in the valley of Krnica, between two hills: Kanin (2587m) and Rombon (2207m). It is suitable for everyone who wants a lot of adrenalin and loves speed. Can you imagine floating on a rope 1300m above the water level? Do you want to know the feeling sliding down 5 ropes above the Krnica valley between 500 and 600m long? Experienced and entertaining guides and breathtaking views over Bovec valley will take care of making the most frightened become heroes! Guides will give you a safety belt, gloves, helmets and your adventure will start. 200m above the ground and at speed of 50-60km/h you will be flying free as a bird and soaking in the beauty that nature gave us. Zipline is suitable for all adrenalin junkies, couples, families, groups, as well as those who want to overcome the fear of height with unforgettable experience. You can adjust all of your cookie settings by navigating the tabs on the left hand side or on top (mobile).